You are reading page 2 of Not all nurses eat their young.... If you want to start from the beginning Go to First Page. Her and a second nurse sat me down at the nurse's station and together we watched a YouTube video on the skill. Then they both helped me gather the supplies and had me access the port, while they helped and walked me through the skill. With their encouragement, and a wonderfully kind patient, I was able to do it mostly by myself! It made me feel so fortunate and lucky to be in a department where nurses will go even a step further and search out the student to do an interesting skill. How amazingly fortunate you were! There are times when I wish I had the time to give this kind of mentoring but the reality of the job is that most of the time I barely have time to do what I need let alone sitting with a student to watch a video and then wait for her to complete the task or skill! I hope that other students reading this realize that NOT doing this for them doesn't mean we don't want them to succeed or don't feel like helping them. Sometimes our patient load (or patience that day) just don't allow it. That unit sure set a high bar for everyone else lol! I just started, over a month in. Adult in-patient psych, a ton of med surg thrown in due to the unique needs of the population. I love my unit. They are the most supportive bunch of people. It can be all hitting the fan, but I know they're there for me. And I'm there for them. They're a tough love, throw me into the deep end unit (which some could mistake for NETY) .... BUT IT WORKS. All of my nursing instructors were fantastic. They were stern, fair, and prudent nurses. We were taught early on we were there to help the hospital - not the other way around. There was only one time when a nurse didn't want to take a student, and as a new nurse I certainly understood how she felt. I worked with a highly organized night nurse who helped me develop a routine and get down to business - take everyone to the bathroom, assess, chart, give meds once everyone is settled. She was awesome to work with. My preceptor was very understanding and kind, even in a difficult ICU setting. I often think about how she would handle sticky situations nowadays and I use her firm but compassionate tone. The first floor I worked on had very experienced and helpful nurses! Whenever I needed help, I got it - not always right away but they made time for me. I have been very lucky but you need thick skin in general in nursing - just because people are frazzled or short with you, it's not NETY. This is a fantastic and refreshing idea for a thread. So thank you! I'll be back later to contribute more but I have a hospice call. I just wanted to chime in with kudos! Because their success is my success at the end of the day. This is undoubtedly the truest statement I have read in a long, long time. And I've never felt that a nurse who didn't have the time to do this didn't want me to succeed or didn't want to help me! If anything, me just being in the room and watching is a huge opportunity! I think most students would agree that nurses can have enormously stressful and busy jobs, and so any tidbits that they share are so deeply appreciated, but definitely not expected! These stories are reminding me of a cool shiny new thing I had last week. I had a TLD for the first time - for real, that's what they called it - a "tiny little drain." I'd never seen one before in my life. It was in the front of my patient's neck after a major spinal surgery - she had the TLD in the anterior neck site, JP in the posterior neck site, hemovac to the low back site (I'm talking a 9 hour spinal fusion with multiple flips/multiple surgical sites, multiple bone harvest sites to rebuild her vertebral column). She was only with me because she spent eight of the nine hours face down on the OR table, and even with steroids, she had massive throat/neck/facial swelling, and the surgeon was a little concerned she was going to need intubation for airway protection because he thought her throat might just swell shut. Not sick at all, alert and oriented, pleasant. The TLD was a super simple drain - tiny, narrow tubing going into the wound (looked an awful lot like the tubing attached to a butterfly needle), a vacutainer connector like you'd use to draw blood, a red tube, and then a cover for the red tube. You just unspiked the previous red tube and replaced it with a new one when the current red tube filled up, and then put the cover back over it so the red tube didn't come off and expose the needle to poke someone. I asked her if she minded feeling a little like a zoo animal for a bit, because I've been in ICU for four years and I'd never seen a TLD, so I was willing to bet almost none of my coworkers had, either. She said she didn't mind, so I rotated 12 of the people working with me that night through the room. Every time the red tube in it filled up and it needed a new one, I went and got two more people, and had someone else do it. xD It was fun. One person had seen it before, but it was new to everyone else. I didn't even know NETY was a thing until I joined AN. It might be true that some nurses are meaner than others, but isn't that just life? In any area of life you'll get people who want to tear you down. Generally though, I have found the entire nursing community to be very helpful and supportive of new nurses. Maybe I've just worked in some great facilities, but I like to think that nurses are usually pretty cool people. I had one supervisor in particular who was just great. She would make sure to let me know of new procedures or treatments and gleefully answer any possible questions I had. I hope to be that encouraging and willing to share my knowledge to new nurses someday! I realize that there are at least half a dozen nurses who come to mind immediately as having been nice, willing to teach, and decent. how rude and mean they were and realize that their behavior was due to personal unhappiness that they brought to work with them. Thanks for this positive thread, OP. Yes, I have gladly and pleasantly helped numerous students and coworkers. Oh how I wish that this was true. Sadly there have been many threads posted in which students have bitterly complained that the nurses "won't" teach them things, won't show them things, or just make them stand there watching when what they REALLY want to do is get a skill checked off a list. 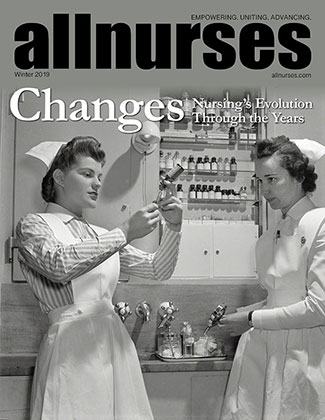 I've cringed reading how nurses are responsible for teaching students what they want or need to know (instead of focusing on their instructors) and it gets hard to listen to after awhile. Appreciative students like you are the reason I DO like having students (mostly lol). But for some out there, they can make it pretty hard to get past the "you owe me an education" kind of thinking. Thank you for this reflection! Even as a third semester nursing student, clinicals can be quite intimidating. This was encouraging to read!